Crossrail worked with the British Quality Foundation to develop a’ Spot-On’ training course to improve the effectiveness of the Non-Conformance Reports (NCR) process across the programme and create a culture where issues are reported allowing them to be dealt with in a controlled, transparent and efficient manner. This has resulted in an increase in NCRs being reported and the Spot-On tools being exercised on site. This learning legacy page explains the format of the training and associated material which may be of use to future projects and programmes. What was the Purpose of Spot-On and How was it Used? 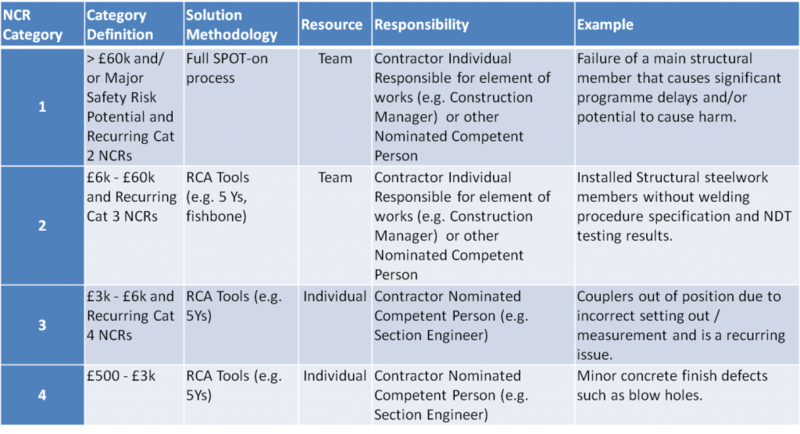 Reviews of Crossrail Project performance identified that whilst Non-Conformance Reports (NCRs) were being raised, root cause analysis of problems was not necessarily being completed effectively. 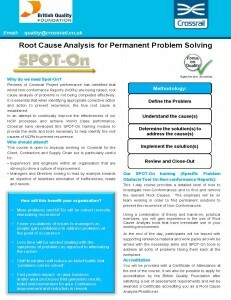 In an attempt to improve the effectiveness of the NCR process a bespoke training programme was developed in partnership with the British Quality Foundation (BQF) to provide the skills and tools necessary to help identify Root Cause Analysis for Permanent Problem Solving. It was rolled out internally and to Tier 1 Contractors and their supply chain in a series of one day training courses. 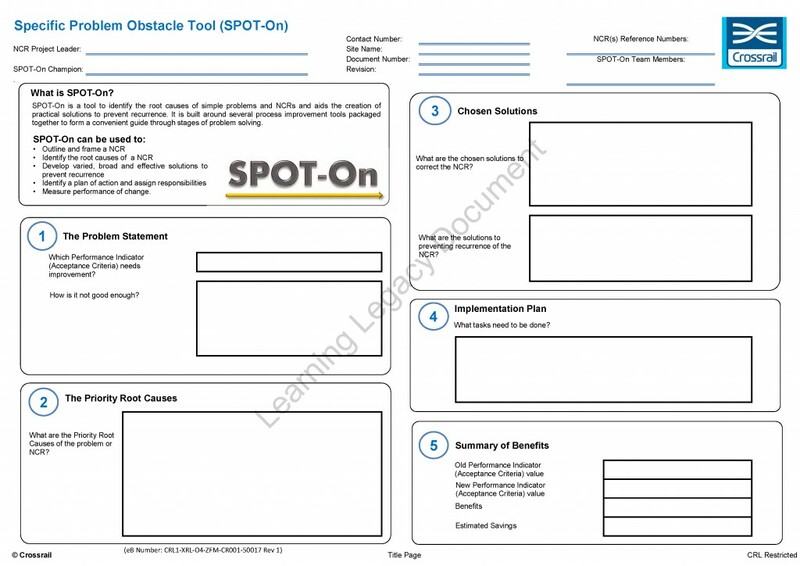 Specific Problem Obstacle Tool – On Non-conformances (SPOT-On) is a tool that has been used to resolve non-conformances (NCRs) through intensive discussion and brain storming. In an attempt to continually improve the effectiveness of the NCR processes and achieve world class performance, Crossrail developed this SPOT-On training module to provide the skills and tools necessary to support and identify the root causes of NCRs and prevent recurrence. 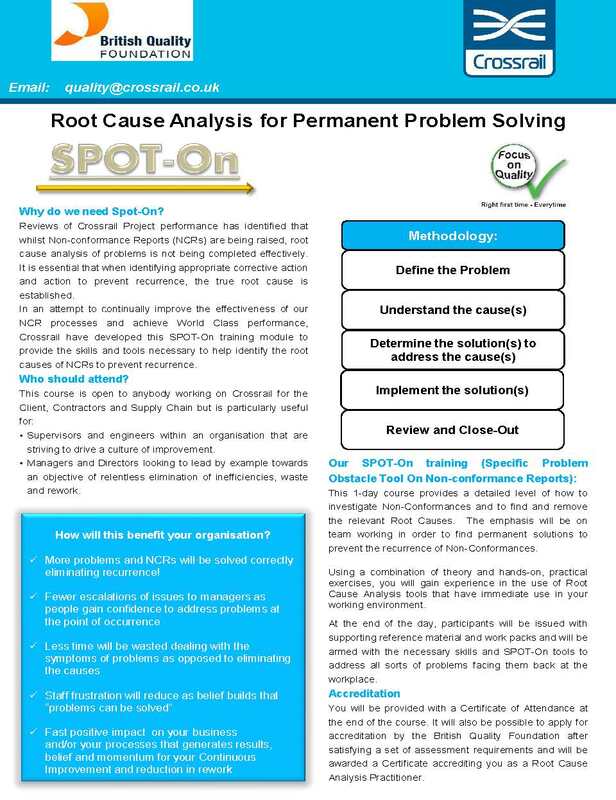 Following a one day training course, the delegates are provided with an opportunity to gain a ‘Root Cause Analysis Practitioner Certification’ by submitting a live non-conformance example by completing the Spot-On template below which is assessed by The British Quality Foundation. Download the full Spot-On template here. The Spot-On techniques are not limited to the Quality Teams and the selection process of delegates on the training days was aimed to be as diverse as possible. Since the original pilot in October 2014, 332 delegates have been trained over 30 courses. 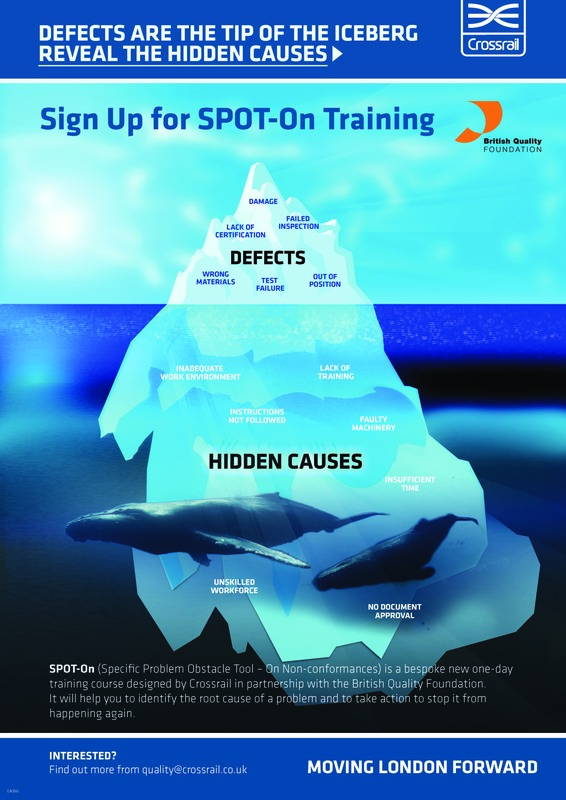 5 people went on to become certified as root cause analysis practitioners with The British Quality Foundation. Crossrail has witnessed an increase in NCRs being reported and an increase in the Spot-On tools being exercised on site; the majority of feedback is from our contractors. 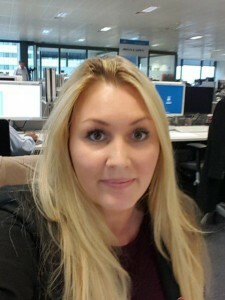 Since October 2010, Crossrail has increased the motivation and willingness of Contractors to raise NCRs and to utilise the eB Project Technical Request system in order to create a culture where issues are reported allowing them to be dealt with in a controlled, transparent and efficient manner. Raising NCRs is and has been a positive exercise on the Crossrail project. Therefore, the benefit to future projects is to continue to promote the teams to work together in order to find permanent solutions to prevent the recurrence of non-conformances by using the combination of theory and hands-on, practical exercises for immediate use in their working environment. 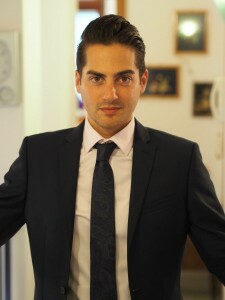 Biagio is the Quality Analyst and Team Administrator at Crossrail and has been there since December 2012. He is responsible for the weekly reporting on the status of Requests for Information (RFIs), Non Conformance Reports (NCRs) and Field Change Documents (FCDs), as well as various ad-hoc analysis and reports for the business. He also ensures that the team have the support they need on a day-to-day basis, championing and coordinating events such as Contractor Performance Assurance Assessments , World Quality Week and the Management of Spot-On Training maintaining a strong focus on how we can continually improve. Biagio’s career as a resourceful senior administrator and team manager covers over 20 years of experience within retail, e-commerce, recruitment and construction providing support to executives and the internal and external teams for companies such as lastminute.com, Arcadia, ASB NZ and Vodafone.